I ask students anytime they share to respond only with “thank you.”…”Thank you” became a turning point in developing students’ confidence to share their writing in a peer conference. “Thank you” stalled students who were excited to correct other writers’ work, created a cushion for students who lacked confidence in their writing, and developed listeners. A simple “thank you” allowed students to listen and respect the thoughts of their peers without worrying about how to respond. Franklin, Keri. 2010, May. 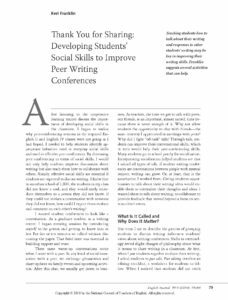 “Thank You for Sharing: Developing Students’ Social Skills to Improve Peer Writing Conferences.” English Journal 99 (5): 79–84.